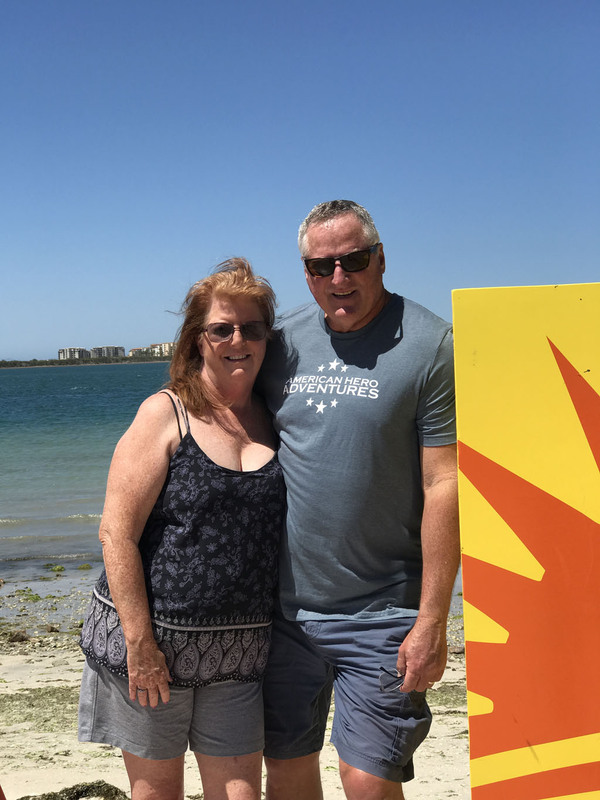 I just wanted to drop you a note to let you know how much my wife Debbie and I enjoyed being part of the American Hero Adventures couples retreat in La Paz, Mexico. The organization of the trip was fantastic from the time we boarded the plane until we said our goodbyes before going home. We never felt like we needed to worry about anything, and the scheduling was perfect for us. Having a break between the two days of fishing gave us a chance to rest up for our second day at sea. Deb and I agree that the day spent swimming with the sea lions was awesome! Being able to have that interaction was a “once in a lifetime” experience. The company you used to guide our excursions is truly a first rate operation. We felt pampered from the beginning when they took time to fit each of us with appropriate snorkel/wetsuit equipment, and from then on as they treated us like their most favored guests. The camp in the cove where their chef cooked our lunch was beautiful, and the food was fresh and of restaurant quality. The staff and facilities of the Hotel Marina couldn’t have been better. We never met any staff member who was having a bad day. They all went out of their way to make sure our stay was the best it could be. The meals they provided for us exceeded our expectations, and the other restaurants in town we were able to dine at were also fantastic. We enjoyed being able to eat at the different venues to experience the wide variety of dishes the city had to offer. We are very thankful to have been able to be a part of the La Paz trip. Meeting fellow guests made this trip even more enjoyable. The friendships we made with them is something we will cherish. The American Hero Adventures organization is truly a gift from God. I am a retired Deputy, having served nearly 29 years in law enforcement. I also served my country in the Army Reserves from 1970 to 1977. For my wife and I to be welcomed on this trip by active duty personnel and their spouses really gave me another sense of connection to the people who serve our great country. If it weren’t for CPT Givens and his crew, none of this would have been possible. Thank you for your past service, and I pray that others will see the great things you and your organization do for our county as you continue to care for the well being of others.